Up Front Pricing & No Hidden Fees! 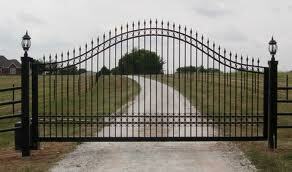 We can repair or install any manufacturer steel gate and gate opener. Our gate technicians carry welding equipment on the service truck to make most repairs on site. Gate opener repairs and adjustments can be completed in a timely manner with our experienced techs and most repair parts stocked on their trucks. Driveway swing steel gates are available in two swing options. 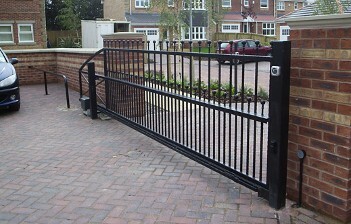 A single swing steel gate is the most economical gate system. Single swing gates have a maximum width of 16 feet in order to operate within the automatic opener limits. A bi-parting swing steel gate is the most elegant of driveway entry gates. Bi-parting swing steel gates swing in or out from the middle of the gate and can accommodate wider driveways up to 32 feet. A sliding steel gate is commonly used for commercial gate systems but is becoming more and more popular with residential homeowners. When swing out space is limited, slide gates provide the perfect solution. Home | Garage Door Service and Repair | New Garage Doors | Cedar Garage Doors | Garage Door Openers | Gate Repair and Installation | Metal Buildings | COUPONS!